I was figuring out the suspension I want to use on my next teardrop and ran into Deepmud on another site and then again on here - I tried to email him on the other site but it kept crashing on me. 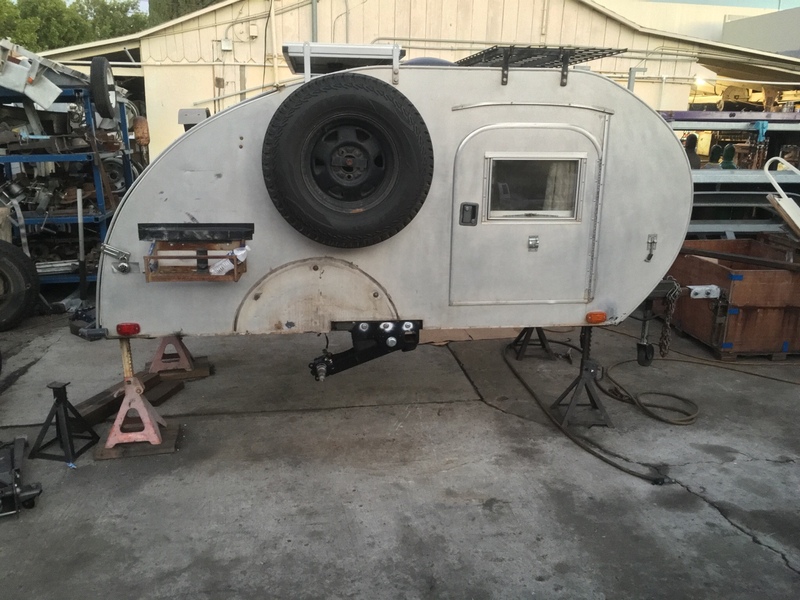 he had a thread a few years back at http://tnttt.com/viewtopic.php?f=39&t=27386 that I found fascinating for it's use of rear torsion bar suspension for an offroad trailer. I found out through his thread on here that he used a mid-80s Subaru suspension as seen here so no longer needed to contact him. I was wondering, given the difficulty of finding suitable donor Subarus or VWs, what about an aftermarket VW suspension like at http://www.appletreeauto.com/TRAILING-A ... 2-TA3X3T2/ ? I wonder if the manufacturer could even be persuaded to offer a lower-cost version of that setup with only stub axles for trailers? Thoughts? For an off-the-shelf new-parts build, I'd try Timbren - modular, compact, easy to build a frame around it. They call it "axel-less"
When I fully emptied the trailer to take it to the shop for the suspension to be installed, the leaf springs had it bouncing all over the asphalt. I mean, really! This is a regular paved city road. On the way back home with the Timbren installed, it was smooth riding all the way. Same road, different suspension. It was a real education getting the details. What I wanted was heavy duty metal, but lighter springs because the TD is much lighter than a loaded utility trailer. I have what Timbren calls "Offroad tires," mine are are 30"x9.5" and the bolt pattern matches my Jeep. The Timbren spindle is offset for these wider tires. But in spite of taking lots of measurements & talking with Timbren on the phone, the new suspension came out considerably lower than the old one. (By about 3"). I'm going to have to do something about that, probably buy & install the Timbren 4" lift spindle. Btw; eTrailer.com had the best deal by a mile. I bought part number ASR1T-HDS02. It came with the straight spindle P024 (no lift, no drop, offset for wide tires). The 4" lift spindle is part P025. It is a bolt on, but you have to shim it to get the alignment right. The metal is all very thick, (much heavier duty than I expected) rated for 3500#, the rubber springs are 1500#, & longer offset spindle 8.5" from hub face to frame. 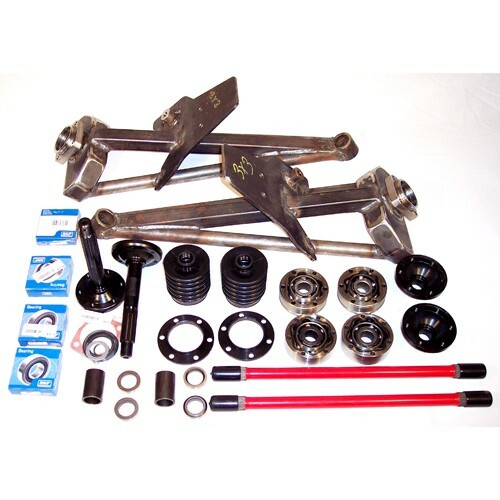 Timbren rated this kit as 2000# for Offroad use. I was able to reuse my standard Dexter hubs & brakes. Did need new seals of course. Cool! I was wondering - is there a brace across your frame where they mount? Seems like they will try to twist the frame a bit. The ride-height difference isn't something I'd considered. Barring a drop spindle, I suppose welding a "frame drop" section would help - it might add to the twist that might be there (but so would a drop spindle?). It's good to see such an off-the-shelf system working well. The rubber springs aren't a new technology so this seems like a good option. Cool! I was wondering - is there a brace across your frame where they mount? Seems like they will try to twist the frame a bit. The ride-height difference isn't something I'd considered. Yes, there is definitely a 2" square brace bar - much like an axle but a bit higher. I'm not really interested in the lack of an axle because after 13 years of wheeling with a straight axle, I have never had a problem with the trailer axle hitting anything or hanging up on a rock. Just doesn't happen. But I am very interested in a softer ride that won't break leaf springs and knock teeth loose. I fully expect my whole trailer will last longer with this Timbren suspension instead of the overly-stiff utility trailer leaf springs. I believe I have figured out why I was breaking leaf springs (has to do with the wrong way the shocks were mounted) but I am still really excited about this Timbren suspension. I feel it is important to distinguish between the Timbren Axle-Less suspension and a Torflex suspension. Although both include rubber & metal, they are completely different things. Completely different. The Timbren is similar in design to a Trailing Arm suspension. Here is a photo of the inside drivers side wheel, looking from back to front. You can't see the cross bar, but you can see the spindle height, which is pretty close to the trailer frame height. This is the straight spindle. I'm going to get the 4" lift spindle in next week. That huge shiny bolt is the suspension pivot. You have a lot of off-road experience with your trailer, whereas I have only a few miles of rutted dirt roads with mine. But, I feel that you're not giving enough credit to leaf spring axles, which came first, and still remain. Look at 4wd vehicles & off-road-specific trailers: all types of springs are used (leaf, coil, and airbag/hollow rubber -Aeon, Sumo, Timbren-). But, if leaf springs were so insufficient to do the job, why were all Jeeps (the first brand most people think about when 4wd comes to mind) leaf-sprung until '97 (56 years)? True, leaf springs are old-school, can be rough, and jarring. But, if one breaks out in the wild, you can use a ratchet strap to secure it, and get to civilization to find a replacement (if using common sizes, no problem, they're everywhere), or if using re-purposed automobile springs, junkyards. 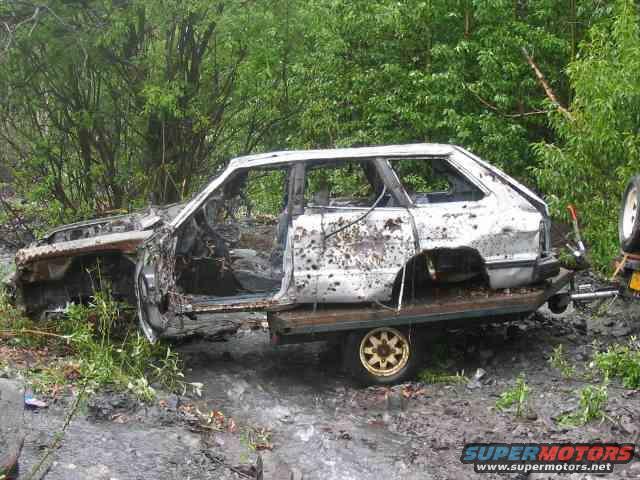 Coil springs have no temporary fix, nor broken airbags, that I'm aware of. And the hollow rubber springs: unless you carry a spare rubber "donut, puck" with you, replacements are rare in the wild. I have had a leaf spring break once or twice, and limped home with it that way. There were two places within 5 miles of my house with matching replacements in stock! Another thing I feel favoring a leaf-spring axle is the usually strong spindle-to-axle weld: I know of no one that had their spindle break off, while I know of occasion where a spindle broke off a torsion axle (same sort of working motion on a Timbren; I was wary of that when I was deciding an axle upgrade. I upgraded a weak leaf spring axle setup awhile back, and chose a Dexter 3500 lb axle with brakes, for $400 ( after adding installation hardware, shackles, springs, etc)... The other system I considered was a Timbren with brakes, for $800+ (I don't know what it would've cost to install it). With either choice, I would've had to (and did) beef up my frame with heavy steel reinforcement, for $75 more. I chose the Dexter because of familiarity, trust, experience, and cost. I, perhaps, put too stiff of springs on it (3000 lb set) since my trailer is about 1750 lbs, loaded, but I can easily step that down to less, since new 25.25" springs are under $30 each.If you order the wrong rating with Timbren, it's $100-200 to change the spring rating (torsion axle- you can't change the rating, coil springs- replaceable like leafs= cost unknown). It's a choice worth considering well; buy/install what you're comfortable with (figuratively, physically, mentally, financially). working on it wrote: I feel that you're not giving enough credit to leaf spring axles, which came first, and still remain. I left one point out of my dissertation above: both times that I've experienced broken leaf springs (and the one-unmentioned shackle tear-off) there was no bumpstop to cushion/limit the flexing of the spring past its' working arc limits. In the case of Dave's spring breakage, the leaf spring had nothing limiting it from flattening out, or even reversing its' normal arced shape (except for the shock bottoming out), resulting in a severe jolt, and breakage. Now, even Timbren recognizes the problems of over-travel in their suspension, and sees the need to "progressively" absorb the energy before the absolute "stop". I chose not to use shock absorbers with my new leaf spring suspension (with relatively little travel), reasoning that the shock absorbers couldn't absorb enough energy in their limited motion to do much good before their absolute stop was reached.And, I was going to add a bumpstop to prevent the possible overtravel of the leaves past the flattened arc stage. So, I combined the functions of shock absorber and bumpstop into one, using a Daystar progressive bumpstop, made of resilient polyurethane, as an active part of the system (always in contact with, and following the motion of the axle); sorta like Timbren does with their component. I described my "active bumpstop suspension" in my thread: http://www.tnttt.com/viewtopic.php?f=35&t=59570#p1075076. The reason jeeps and Jeeps have had leaf spring suspensions for so many years probably has as much or more to do with the fact that they have live straight axles at both ends, precluding the use of independent suspension. Once that design choice is locked in, so to speak, leaf springs become one of the simplest manufacturing and assembly solutions. The reason that modern day Jeeps have shifted to coil spring/link suspensions has as much to do with the market no longer tolerating harsh bouncy riding vehicles. As soon as the TJ came out (first with coil springs), Jeep sales boomed and the resurgence continues. YJ or XJ leaf springs are much longer and softer than typical trailer spring packs, and are also load rated more closely to typical TD trailer weights. If it wasn't for the higher cost (and I wonder about the total weight differences) I can see the attraction to the Timbren system. Last edited by KCStudly on Fri Mar 03, 2017 7:06 am, edited 1 time in total. I remain paranoid about dragging an axle over a boulder. I feel pretty comfortable predicting where the tires and therefore the pumpkin will pass with my rear axle. Not so much the trailer axle (once the turns become extreme) because of the vehicle geometry. I find the notion of not worrying about hooking the axle on a boulder in a switchback a compelling feature. Now, ask me again once I've tried it with the Timbren. AzAv8r wrote: I remain paranoid about dragging an axle over a boulder. Put a wheel on it! as the tires go over the rocks. 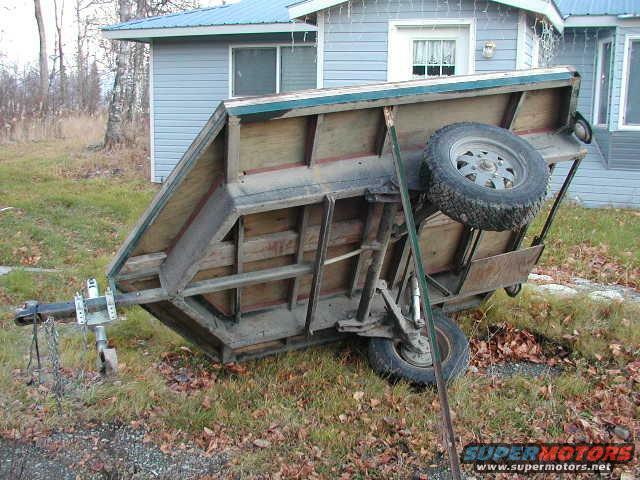 Is your off road trailer too low? Exactly. Perhaps I was not clear. In most tow vehicles, it's trivial to put the rear wheel where you want it, and clear the axle. In *really* tight terrain, the line the trailer follows is vastly different than the line the tow vehicle follows, with the inside tire 18" to as much as 4' inside the tow vehicle's inside line. I know how to keep the axle from dragging (a spotter, or a very slow traverse), but I don't want to worry about it. And you do not have the same degree of control over the line the trailer follows. In my experience tight terrain usually has some large rocks at the inside of the switchback. If your tire rolls over the top of that, you are golden. If it rolls inside of it, you are going to have a long day. I have never hung an axle, but the time I've spent making the turns is excessive relative to the time on the trail. I'm there for the journey, not the challenge of the switchback. After over 20 years of hard use, I'm really happy with the massive clearance of the trailing axle design. You ignore the trailer clearance, just drive the tow rig - but it's not about primarily clearance - it's soft riding because it has low un-sprung weight, something a solid axle just will never have. Soft riding at speed over dirt roads with a few hundred pounds to half a ton or more of load - not clearance while crawling over rocks - although, my trailer clears rocks with little bitty tires as well as my solid-axle Suzuki with 39.5 Boggers. 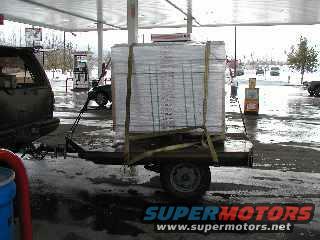 here it is about 10 years ago with 2200 pounds of flooring on it - I've packed the bearings once since then. And put 15" rims on it. Durability test: passed. 20k miles of highway - passed. Soft riding, doesn't beat up my camping gear - passed. Of course, the 1989 Subaru axle may turn out to be more durable than a Timbren - but it looks pretty good - I'm looking forward to more input.